I’ve written previously about how I use Trello to organize my teaching and large programs/events, so in this post I thought I’d take a look at my Trello “Workbox”, which is the overall system that links these together at work (I use similar boards/boxes for home and dancing). I call it a workbox as I’ve borrowed concepts from the Organize365 workbox system. I’ve also borrowed from the Getting Things Done (GTD) system. My workbox is just a board, that has three main parts: inbox, action, and reference. The action section has five lists: Service/Admin, Teaching, Research, Waiting, and This Week. Service/Admin, Teaching, and Research are the main components of my job, and so these lists host all of the projects and tasks I have to do in these areas in the current semester. Anything beyond the current semester is on another board (one for each of these areas), and I will start to pull from those boards towards the end of the current semester. So, for example you can see in my Research lists that I have the 2020 AAAL call for papers, which is technically a summer due date (although notably I haven’t actually added the due date yet, which I would if it were in Spring). The “Waiting” list is for projects that I’m waiting on someone else for (it’s under review, I’m waiting on a colleague’s feedback, to hear about a grant, etc.). Having these here also reminds me to follow up if it’s been too long. The “This Week” list is what I need to work on this week. During my weekly planning each week, I pull projects from the Service/Admin, Teaching, and Research boards into “This Week” and then plot the times I’m going to work on them on my calendar (to prevent me from having overly ambitious plans). Some cards, such as my classes, basically live in this list all semester long. Most of these cards also link to separate Trello boards for these projects. For example, if I click on a class card such as ARAB 212, you can see that I can click through to the board for this class. The transitional list between action and reference is my “Done” list for the current semester. As I complete projects and tasks, they move here, and become a reference of what I’ve done during the semester. This is useful for my end of semester review and also for updating my CV, which I try to do at the end of every semester. While I’m unlikely to forget major events (such as a paper being published), there are plenty of smaller things that I would forget I accomplished if I didn’t have this list. Since there are always more projects to be done, it is also nice for me to see that I’m in fact completing things as well. The more standard reference lists are “Reference” (for the current semester), “Loaned”, and “Read”. The reference list is where I put cards that are attached to another card. I use this system when the project doesn’t quite warrant it’s own board, or I have information I want to keep separate. For example, for AAAL 2019, I attached my travel and presenter information to the “AAAL” card, and then just put those cards in reference. Because every card in reference is attached to another card, I just dump them there without worrying about how they are organized in that list. The “Loaned” list is for things I’ve loaned to other people (so I remember to ask for them back). The “Read” list is for articles (academic and otherwise) I want to read, usually while reading other things on social media or for research. I try to add in some reading time at the end of my Weekly Review, but it doesn’t always happen, so I try (not always successfully) to just delete from this list every week so it doesn’t get overwhelming. This is admittedly more aspirational than reality, as there are just so many interesting things to read! Each week in my weekly planning session (usually on Friday), I rearrange my board by moving stuff from the Inbox to the appropriate list, moving stuff from This Week to Done if I can, and moving things from the action lists to This Week. Then I plot the “This Week” stuff onto my calendar to make sure it all fits, and if it doesn’t, move it out of “This Week”. I also do a quick “filter by due date” on the whole board to make sure I’m not missing something coming due (usually buried in the Service/Admin list). I use similar boards and process for home and dance, and I also have actual physical boxes for work, home, and dance that I keep actual papers in (I tend to leave things in the form they arrive in, so mostly digital, but still some paper). Every semester, I do a major cleanup of the board during my end of semester review. So, that is how I keep my semesters organized! How do you link your projects and tasks together throughout the semester? Do you use Trello in a similar or different way? Last Fall, I wrote about how I use Trello to organize my teaching. Another area I find Trello very useful for is organizing large events or programs, in my case dance competitions and our summer Arabic STARTALK program. Although a dance competition and a summer program for middle and high school students seem like very different events (and they are!) the structure for organizing them is similar. So, while I’ll focus on planning the STARTALK program in this post, I think a similar structure can be used for any event. The first thing I do is make a separate Trello board for the event. The first list in the board is the “Inbox”, which is where I save items pertaining to that event (usually from my email). Then, I copy the “done” and “notes for next year” lists from the previous year, and these become a large todo list. Then, I add lists for the months leading up to the event, and distribute the todos across them. Once that month is passed, I move any remaining tasks to the next month and archive the list (so you don’t see January and February anymore). Since these types of events are on top of my regular job and life, I usually have very limited time to work on them in a given week, so it’s important to evenly spread out the prep tasks for months in advance so I’m not caught by surprise in a time crunch. Some of them are also time-sensitive, for example marketing needs to start in January, and admissions needs to be completed by April. When I get closer to the event, I split the monthly list into weekly or daily lists, as the event starts to take up more of my time. For STARTALK, I usually switch to weekly lists in May and June. Following these lists, I have a “done” list, a reference list, and then a “Notes for 2020 list”. The done list is where completed tasks go (yay!). The reference list is for information that isn’t actionable, but that I need, such as a quote, or reservation information. I store these cards in the reference list, but also attach them to whatever actionable card they are relevant to using the Trello attach function. As you can see, there is nothing in this list yet, but there will be as we get closer! For example, if I get an email with the bus reservation information for a field trip, I would save it to this list but also attach it to the card for that field trip. The notes for 2020 list is perhaps the most useful, as most of these events repeat on a yearly basis. As things happen that I want to record for next year, I put them in this list. Then, the following year, I copy this list to the new Trello board and distribute the cards on it among the todos. Most of these items are minor details that make the programs run more smoothly, but that I would not remember a year later (such as the fact that the building is locked from the outside at 5:00, so our orientation should start at 4:30, not 5:00). By continually recording them, and then copying this list to the following year, I’m able to stay on top of these details without exerting mental effort to remember them. 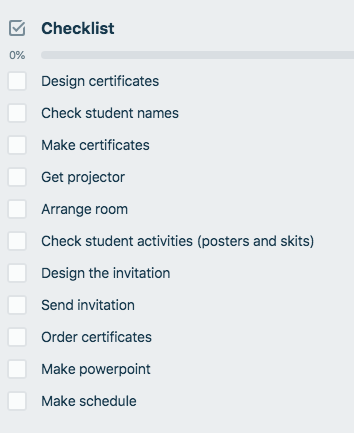 Another useful feature is checklists, for example for daily admin tasks during the program, a list of contacts to send marketing material to, or tasks for a specific program activity, like the closing ceremony checklist pictured here. Again, because I copy these cards from the previous year and add any notes I made, I don’t have to worry about forgetting steps from year to year. I also link this board to a card called “STARTALK” in my semester board, which is where I keep track of all my projects for a given semester. Then, when I’ve blocked time to work on STARTALK, I just click through to the special STARTALK board, and start working on whatever tasks are listed that month. Hopefully, this can give you some ideas of how Trello can organize large projects and events for you, especially if they repeat on a yearly basis. Do you use Trello or a similar system in another program? Let me know if you have comments or useful tips to improve my system!